Until it is demonstrated, we tend to forget the tremendous gap that lies between true biblical leadership and agenda-driven absolutism. That gap was on vivid display in a letter by Mark Woodson to the Sacramento Central Church this past Sunday. These motions are supported by the Church Manual, the General Conference in formal Session and especially by the Word of God which “Liveth and abideth forever” (1 Peter 1:23). In short, these are legitimate, well-thought-out motions to help their Conference align itself with biblical truth (1 Corinthians 5:7). And they should be accepted immediately. This is what good leadership does. 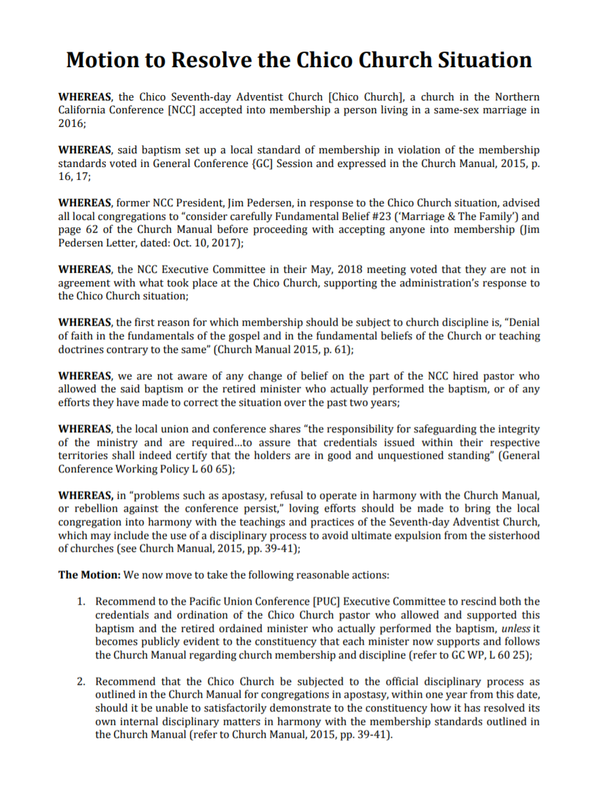 (Here is the full document with supporting pages sent to the NCC Executive Committee from numerous NCC Constituent churches). An elevated, unsanctified pride (Proverbs 16:18; Jeremiah 13:15-16). A belief that leaders are not accountable to the people (Mark 10:42-45; Ezekiel 34:7-10). A belief the leaders are smarter than the people (John 9:34). The revelation that he (and a complicit Executive Committee which woodenly rubber stamps liberal agendas from the President) doesn’t understand the nature of the enemy that they are playing with (Proverbs 14:16; Ephesians 5:11; 1 Peter 5:8). It is exceedingly dangerous for a leader to risk injuring the hearts of the flock in this manner, arrogating to themselves the authority to define sin and righteousness. Let us remember that God issues His harshest rebukes to shepherds who destroy the flock (Ezekiel 34:1-10; Jeremiah 23:1). These motions should have been readily accepted as necessary corrections to bring the Church into closer harmony with biblical righteousness and safeguard our Movement for the children who come after us. But they weren’t. I believe what we are seeing is a new moral code, conceived in political ambience, and bequeathed to the church as the enrichment and transformation of Adventism. Transformed, yes. Enriched, no. Following the lead of their tumescent Division, most of the NAD Conference & Union leaders are now ambassadors for this new moral paradigm and are willingly dismantling the Adventist foundations of truth in order to rebuild Adventism in their own image. And there’s nothing you can do about it. Or is there? It’s time for these leaders and Committees to be held accountable by the people of the NCC, in whose hands lies the real power of change in our Church. It’s time to close the gap. At the Northern California Conference (NCC) Constituency Session on September 30, 2018. The rest of the World Church is watching. ”I am the good shepherd. The good shepherd lays down his life for the sheep” (John 10:11).